On Valentine's Day my husband brought me to a little Chinese restaurant we used to go to a lot when we were first dating. When we opened our fortune cookies, I had to laugh because his fit him so perfectly. 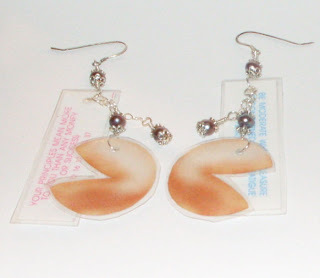 I put both fortunes in my purse planning to make earrings with them. I have a little card laminator. It's not much,but I use it for small crafts and for those occasional laminating jobs my dad asks me to do for him. 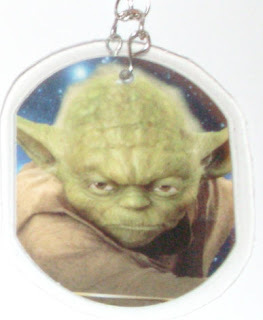 In the past, when I'd done laminated paper for necklaces and such, I trimmed it with enough extra laminate on top to punch through just the layer of laminate. This time I used 2 hole punches. My 1/8 punch on the fortunes and fortune cookies, then after laminating, my 1/16th punch in that hole so it was still sealed around the hole. Sort of like this. The laminate is the teal outline, the paper is the black outline. It worked out very well. Then I used simple wrapped loops and chain to put the earrings together with some pretty pearls and sterling bead caps. You could use your own fortunes and pictures of fortune cookies from the internet. I drew the fortune cookies I used my earrings. I think it makes a nice sentimental keepsake. Packing tape would probably work instead of laminate but it won't be as stiff. Cut out the fortune cookie and punch all the pieces before arranging them in a laminating sleeve and laminating them, then trim the laminate around the images leaving a bit of a margin to keep it all nicely sealed. 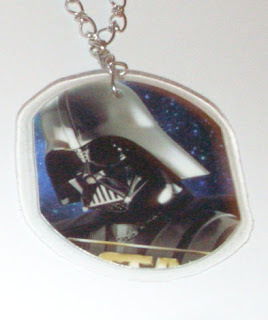 I used the same technique to make this double sided pendant for my daughter using trading cards from the Star Wars Science Meets Imagination exhibit as our local museum. My handy dandy 2 inch circle punch and then trimmed the sides so it fit my laminating sleeves a bit better. I had to run it through the laminator twice to get a real good seal because the two layers of card were a bit thick, but she's very happy with how it turned out. These are WAY creative! I'm totally blown away and love them! I'll be linking to this.